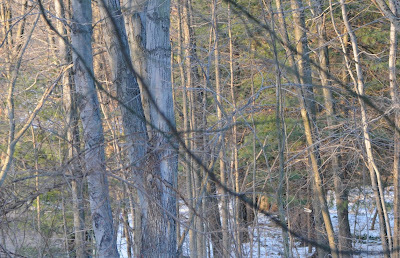 Although winter prevails outdoors, under glass, there seems to be no holding back spring. 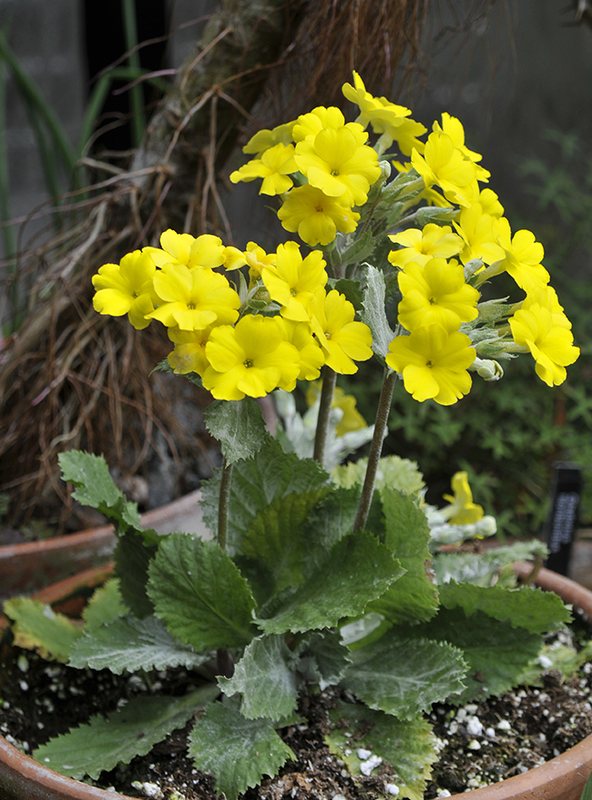 This Primula x Kewensis selection is a very nice one - I can't believe how many flowers it has open at the same time. I can't believe that I haven't posted in a week, that's just not like me, but I've been busy preparing for a new position at work, which I am pretty excited about. I can't really say much about it, as it's just one of those more secret positions again, but it involves futuring, and my new title will be imbedded innovator. It does mean that I will have a new office in downtown Providence at Hasbro's new building, with lots of windows and light, which means that I can have plants, so that part is very exciting! I thought I would share some images from inside the greenhouse today, as even though the official first day of spring happened this week, as many of you know, much of the country is still deep in the clutches of winter, at least, we are here in the North East, with another snowstorm predicted for this week. This is the first year that I can remember, where our Witch Hazels have not bloomed yet, nor crocus, or even snowdrops - the ground is still frozen solid. 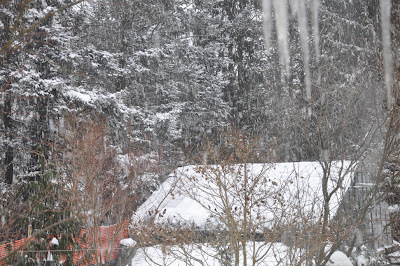 I suppose that it is good for the plants, since often here in New England, it's our early thaws and then sudden cold, that kills many plants. Hopefully, once it melts, things will remain that way. 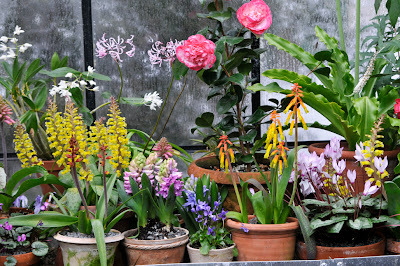 Lachenalia species and some hybrid selections are the current show stoppers in the greenhouse at the moment. This bright yellow one in the center is one which is easier to find in fall bulb catalogs - it's one of the Lachenalia 'African Beauty' series. As easy to grow as paperwhite narcissus, I believe. It smells like 1810. 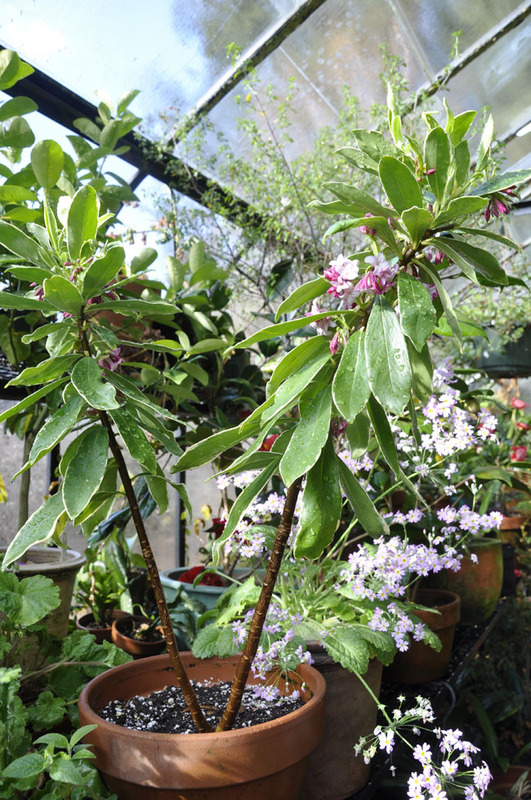 A short-lived shrub, the tender Daphne odora is worth it's space in the cold greenhouse. 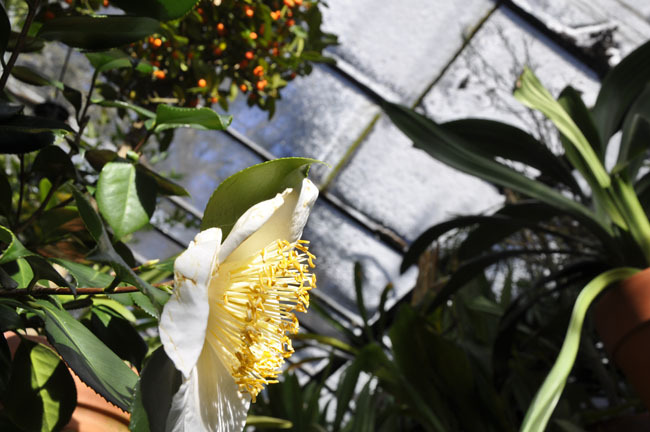 It's a shrub that has scented conservatories and greenhouses in the north since 1800, as it makes a fine container specimen, and treasured for it's fragrant blossoms in mid-winter. It's the first thing ones smells upon entering my greenhouse. 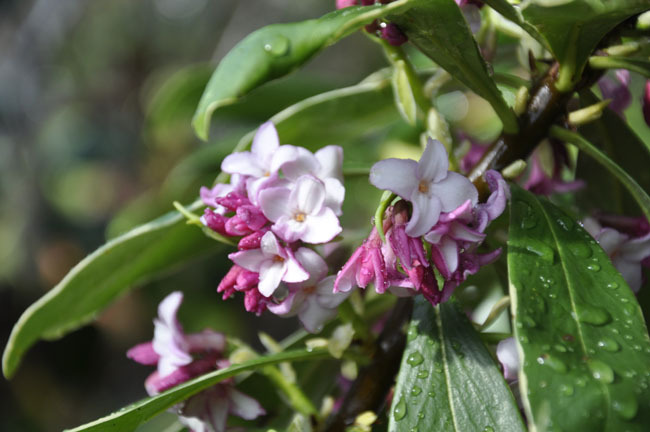 Daphne odora blossoms smell exactly like you took sun tan lotion and mixed it with lemon Pledge furniture polish. Sarcococca hookeriana var. digyna, the Himalayan Sweet Boxwood begins to open its tiny, fringed blossoms which are intensely sweet smelling. Go ahead, Laugh - my Californian friends, (or even you northern Pacific gardeners in Seattle and Vancouver), but here in New England, if we want to enjoy to enjoy the sweet scent of Sarcococca and the even sweeter scent of the winter-blooming Daphne odora, we must grow them under cold glass - i pots. It's not particularly unusual to grow these shrubs in containers, as for nearly three hundred years, they have been grown in conservatories this way, as they only survive in gardens in USDA Zone 8 and up. Here in the Boston area, these were common greenhouse shrubs, and they marked the first sign of spring as they bloomed in late January and February along with specimens of camellias and acacia trees, often hidden behind their showier kin in conservatory displays in the Victorian era, to share their rich scent ever so secretly. Sarcococca is a valuable ground-cover shrub in areas where it can live such as North Carolina and south, or San Francisco to Seattle where it is a choice winter-interest plant. 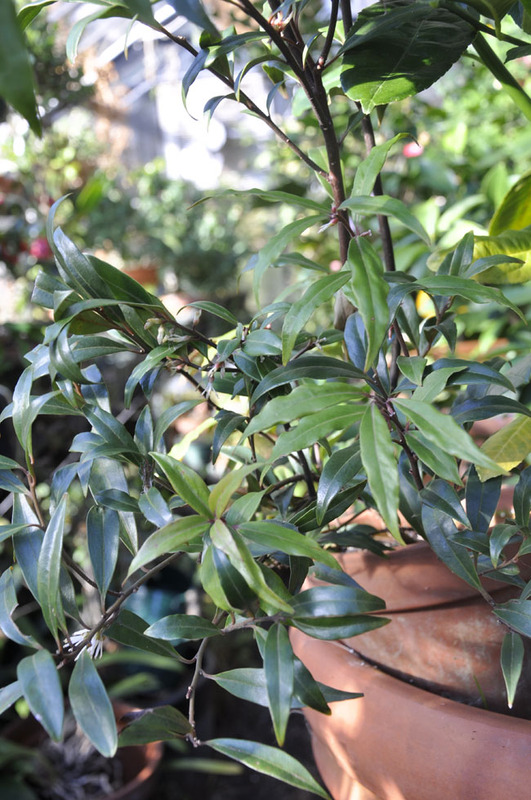 The Sarcococca sits in a smaller pot which sits in a larger lemon, lifting the pot to nose level. The blossoms are small, but they be mighty. In the early morning, just as the sun hits the greenhouse at 8:00 am, the snow that fell the night before still clings to the glass. 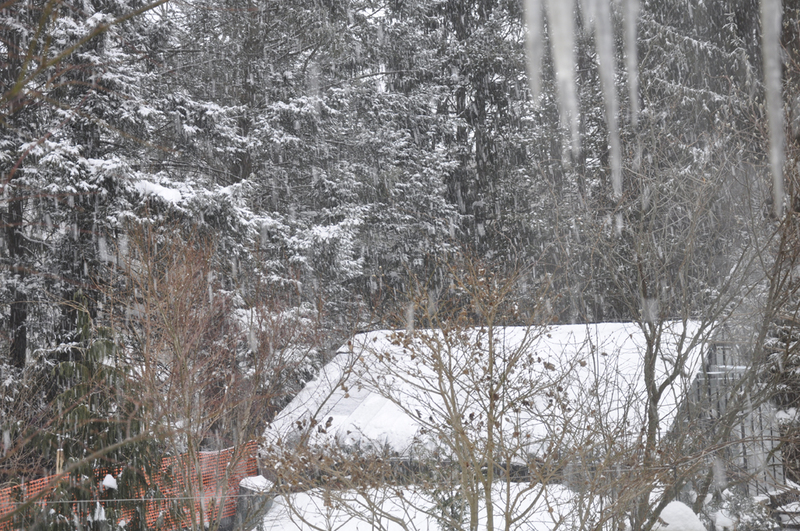 In an hour, it will melt from the radiant heat produced by the sun. This white camellia enjoys a morning sunbeam. 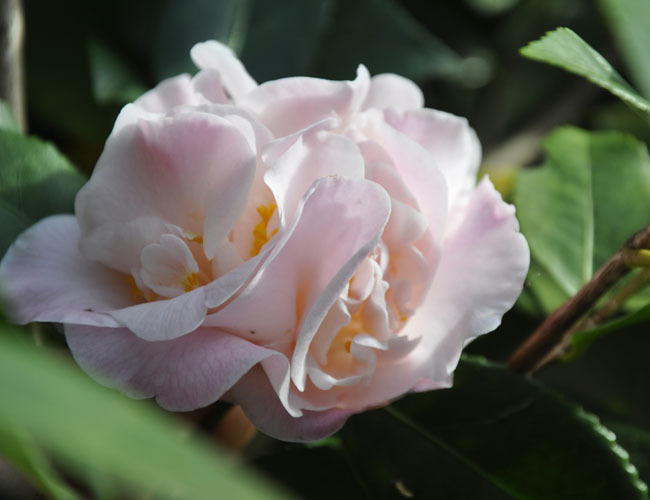 I have one fragrant camellia called 'HIgh Fragrance', and indeed, it is 'highly fragrant, especially when the sun warms the blossoms up. For some reason, I only have a few buds on my shrub this year, so I will only be able to enjoy about four of these yummy blooms. These Chinese shrubs were early imports to the United States, as they began appearing in many greenhouse collections on estates and in private homes in the early 1800's, just after being introduced to Kew in the late 1700's. Just a couple of many important garden plants collected on expeditions sponsored by Kew, and arriving on ships arriving from China. On these first two days of February, the sun already feels stronger under glass ( not outside!). 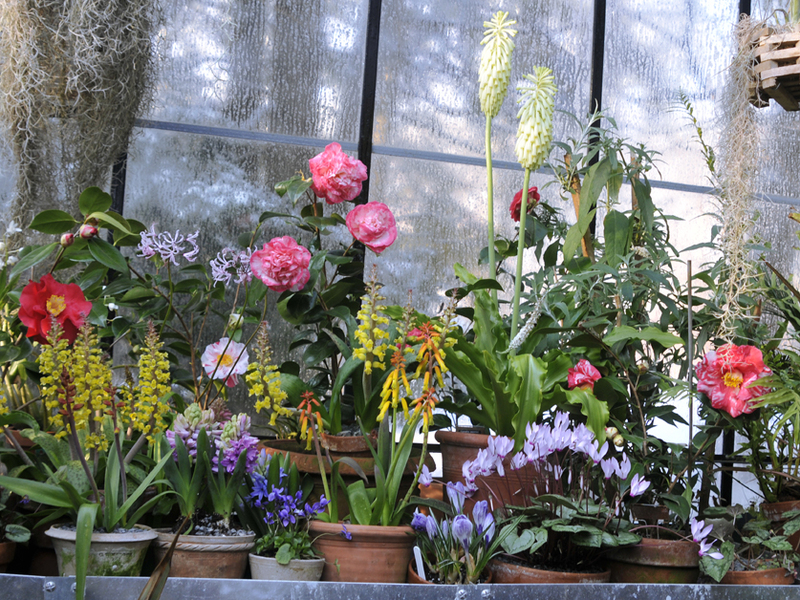 I run from the house to the greenhouse in summer clothes, hoping not to be distracted by early hellebores or loose turkeys, but once I am in the greenhouse, everything changes. 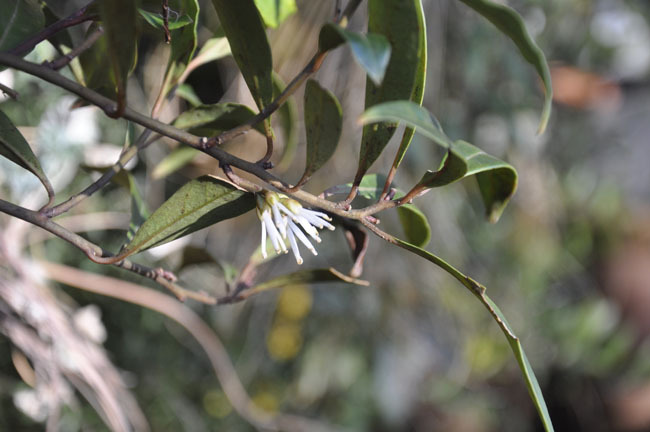 The air is damp and rich with the scents of early blooming plants, particularly the Sarcococca hookeriana var. digyna and the Daphne odora var. marginata, as well as my Primula forbesii which is so fragrant, one would think that I spilled baby powder everywhere ( and a double strength bottle of imported vanilla extract). 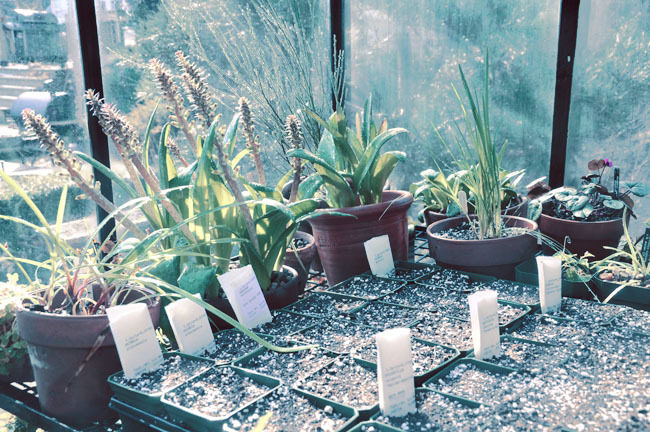 Seeds of many perennials which have been pre-chilled have been sown. This lot includes Crambe maritima, the sea kale, Rodgersia pinnatifolia, many Primula species and others. Starting perennials from seed is very cost effective, but stick to those that are worth growing from seed, and not new introductions. Each week I am starting seeds, orchestrating them from secret areas around the house where I can offer them the temperatures and/or light requirements that each species needs. The red-leaved Bishop series of Dahlias need light to germinate - the celery needs warmer temperatures than the leeks, but both want to have soil temperatures that remain above 70 degrees. Other seeds are laying around in poly envelopes in damp sand, where they will sit for two weeks, damp and warm at 75º F and then be exposed to near freezing temperatures for 4 weeks, this treatment works well for many Himalayan primroses, as well as for Rodgersia, Pulmonaria and European Primroses. I know, it may all seem like alot of work, but on pod of Pulmonaria will give me about 200 plants, and that sure beats buying one for $12.00. I ran out of my black labels, so as I wait for my package to arrive, I am doing the ol' stick-the-seed-packet-into-the-pot-thingy. Come on, you know you've done it too! 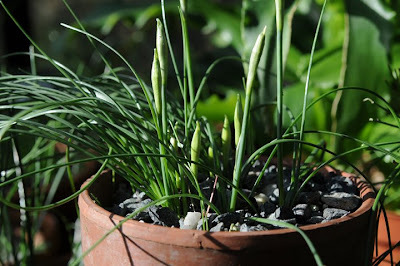 As you can see, my Lachenalia bulbs are almost ready to bloom. Some seeds I purchased pre-chilled, which makes it all easier, and others, I buy from Germany from Jelitto because the varieties are ones that I want ( such as their Aquilegia Bird Series, that I saw in Switzerland. Sure, the seed costs $25, but I will get a few hundred plants. 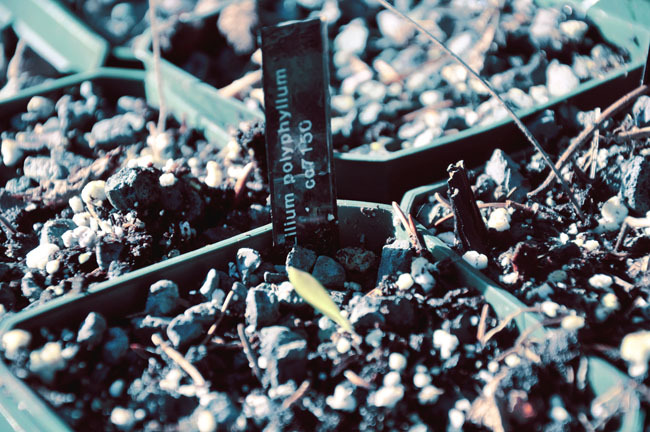 Not all home raised perennials are worth growing from seed, as patented forms and top performers are all micro propagated, or grown commercially. For this reason alone, I would never, ever, save my own seed from, well let's say Echinacea or other perennials that are names varieties. They would be a waste of time and space, as their offspring will only result in weedy, lesser forms of their parents. A rare lily seedling emerges after spending a year and a half in a pot. Another collection of seed from Tibet, one often only gets 5 seeds of some rare species, and even if one germinates after time, it's worth it. 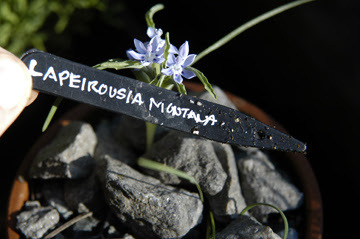 I only grow wild species from seed, or known selections that come true to type. For instance, the Pulmonaria I grow is Pulmonaria officinalis, the wild European form with blue flowers, but if I wanted a find spotted leaved form, or a selection with silver leaves, I will pay for a premium selection. A rarely seen view of the north east corner of the greenhouse, where the ferns live. Now that February has arrived, the sun is beginning to get stronger, and most of these will need to be relocated to shadier places. The windows are steamed up because I had just watered everything with the hose, and the temperature outside is near 18º F.
This is the time of year when space becomes a problem in the greenhouse, as seed flats are produced from the house. As seeds germinate under light units, I begin relocating them to the cooler greenhouse where they continue. Still, many remain in the house under lights until I can ensure that temperatures ini the greenhouse say near 65º. which will happen by the end of the month. Under lights I have snapdragons started, Dahlia, Impatiens, Calibrachoa and Nemesia. All need early sowing, and as I despise growth regulators which all growers use to keep their annuals short and stout, I try to grow everything myself. 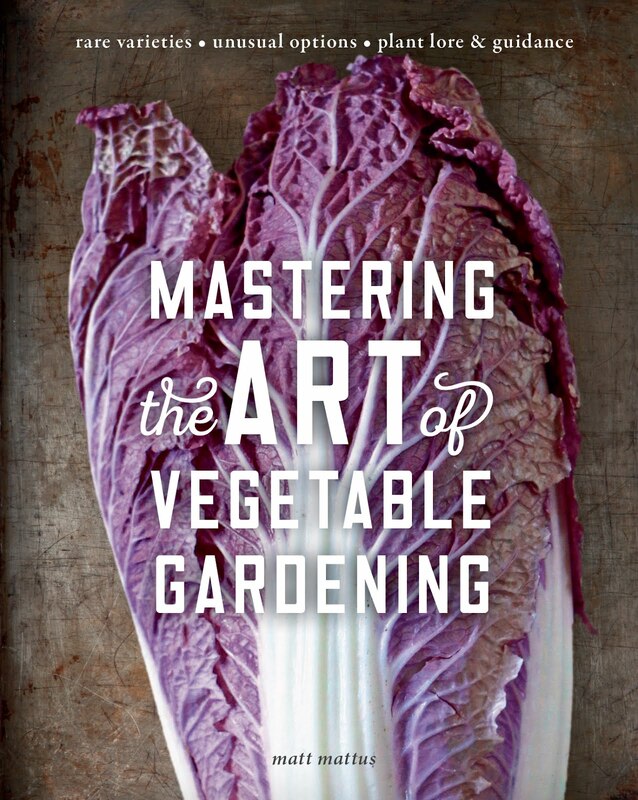 Of course, this goes for vegetables as most growers spray their peppers, tomatoes and lettuce with so many growth regulators starting with root stimulants to hormones to initiate early blooms, to hormones that keep lettuce and tomato plants thick and strong looking, that I am trying to grow all of my veggies this year from seed. 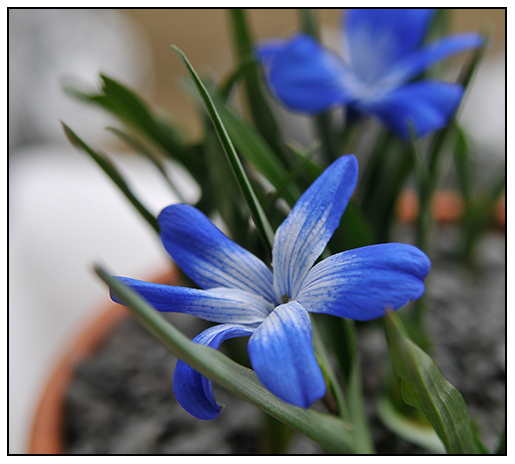 Tecophilaea cyanocrocus ssp leictlinii, a true-blue flower that comes from a tiny corm. Nearly extinct ( or extinct in the wild) this is a plant that today, only exists in private collections. It is the Panda Bear of the plant world. This rarely seen bulb (corm) is one of the real treasures of the plant world. 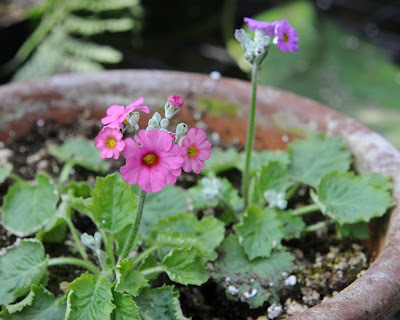 Tecophilaea provides a refreshing burst of true blue to a winter bulb collection ( and will award you with gasps from your friends, or even from the real hortiphiles, as I found out today as we hosted our annual Winter Bash for the American Primula Society. People simply love the color blue, and the plantsmen love it's rareness. Tecophileae cyanocrocus is considered by many experts as being extinct in the wild due to farming, commercial water use and climatic change, but remains in many collections around the world. We do know that it it is not extinct, it is certainly rarely found in the wilds of Chile anymore. Today, it is one of the most desirable bulb plants in the world, if only for its amazing azure color, but surely for its rarity. 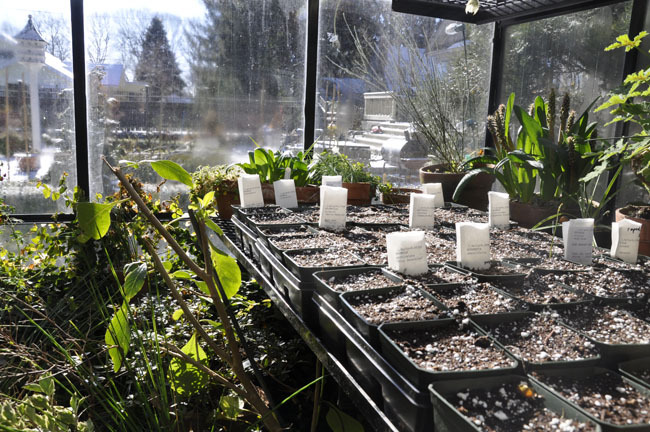 They can be grown from seed if one has a cool greenhouse, but by far, the easiest way to get success will be to order corms in late summer. Not hardy in cold northern areas, some have survived winters in southern England, and Ireland, or in the US where the summers are dry ( Northern California perhaps?). 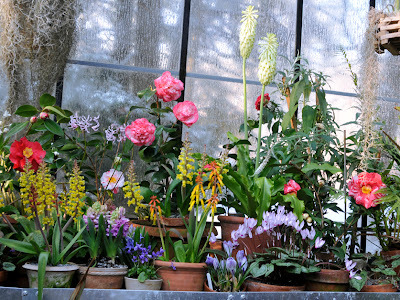 Beyond that, these are only worth growing under the protection of a cold glass or alpine house. CORMS MUST BE ORDERED IN JULY OR AUGUST, AND PLANTED IN SEPTEMBER BEFORE THE BEGIN ANY GROWTH. 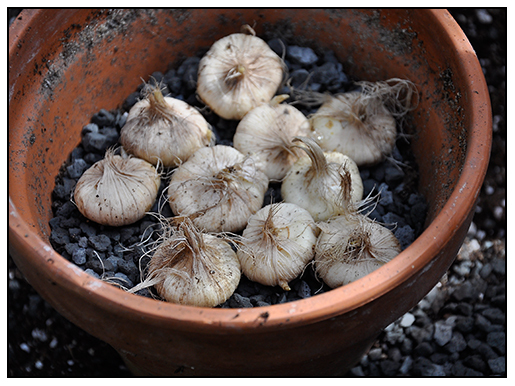 USE A QUICK DRAINING SOIL ( I USE GRAVEL AS THE LAYER BELOW THE CORMS) SINCE THESE BULBS DEMAND EXCELLENT DRAINAGE. FERTILIZE AFTER BLOOMING WITH A 0.5.5 analysis FERTILIZER TO ENCOURAGE CORM GROWTH FOR NEXT YEAR. 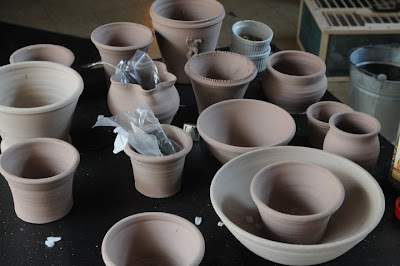 ALLOW POTS TO GO DORMANT AND DRY FOR THE SUMMER. There have been reports lately of a native population being found, but this has not been confirmed - regardless, this is indeed a rare plant. Unique in not only the bulb world for its blue tint, it is also unique in the plant kingdom. Not truly a crocus at all, it's common name comes from the shape of its' blossoms, which some might say, are crocus-like, although both are classified as being members of the larger plant family, Iridaceae, the iris family. Corms are sometimes available from specialty sources such as Telos Rare Bulbs, and Paul Christian Rare Plants, but be prepared to pay for rarity - two years ago corms sold for $60-75 each, last year, $25. each. This year, some were available for $18.00 each. WITH OUTSIDE TEMPERATURES EXPECTED TO FINALLY DROP TO BELOW 10 DEG. 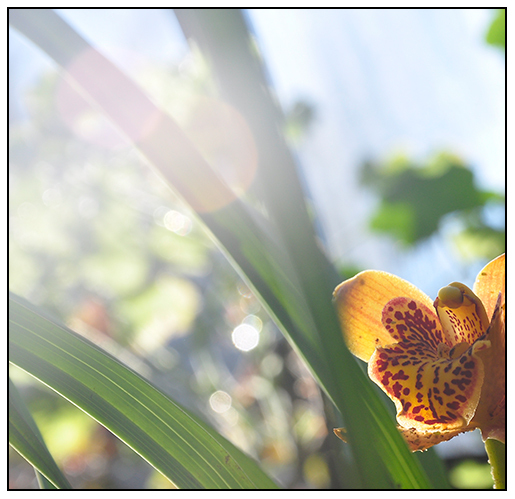 F, A BRONZE COLORED CYMBIDIUM ORCHID ENJOYS A SUNBEAM ON A JANUARY SUNNY AFTERNOON IN THE GREENHOUSE. 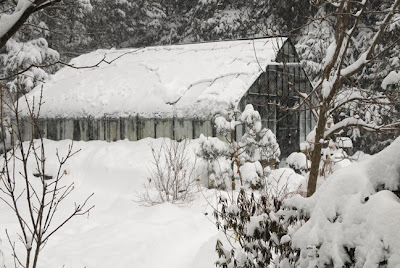 Of the many pleasures one has in keeping a greenhouse in New England is the ability to garden during those months when snow is deep, and outside temperatures are far below freezing. It may be frosty outdoors, but underglass - in a t-shirt- I am muddy and filthy in the good way - with hand pruners, loppers, rakes and hoses. I actually prefer gardening in January in the greenhouse more than a June day in the garden. With the scent of almond and jasmine in the moist, green-smelling air, physical labor under glass in ones own greenhouse is one of the most memorable experiences. I have to admit, even as a snow-lover, with no snow this year, this sure beats shoveling snow! ( Lest we forget - last January). I began my two weeks off from work ( the first full week I took all year), with a long to-do list, and naturally, very little from that list was accomplished. I was never able to get the greenhouse properly prepared for winter with a wrap of bubble wrap inside of the glass, so I do hope that this mild winter continues ( although, 8 deg. F tomorrow! ), but I never really expect to get much done on these staycations. I just let each day dictate what needs to be done. 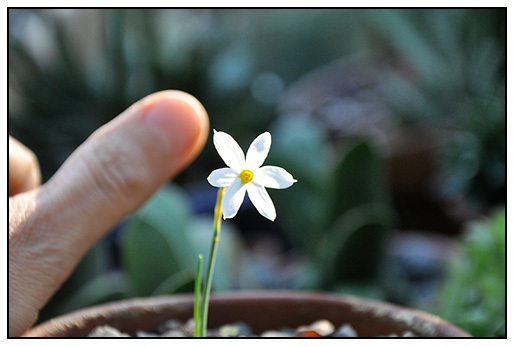 THIS TINY FALL-BLOOMING NARCISSUS SEROTINUS WHICH GROWS IN THE WILD FROM ISRAEL TO ITALY, IS NO LARGER THAN A THUMB. THE FRAGRANT NARCISSUS SEROTINUS. I THINK IT IS TIME THAT I ADD MORE BULBS TO THIS CONTAINER - IN THE WILD, THIS SPECIES GROWS IN DRIFTS. 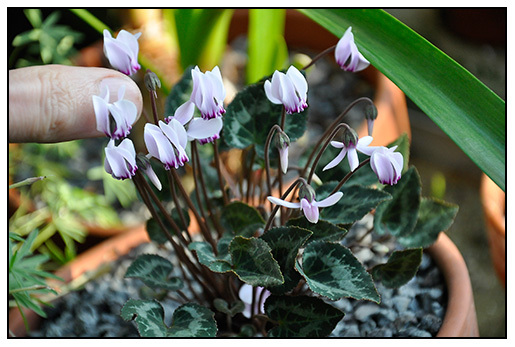 IT'S ALL ABOUT SCALE, IT HAS ONE OF THE TEENSIEST FLOWERS IN THE CYCLAMEN WORLD. 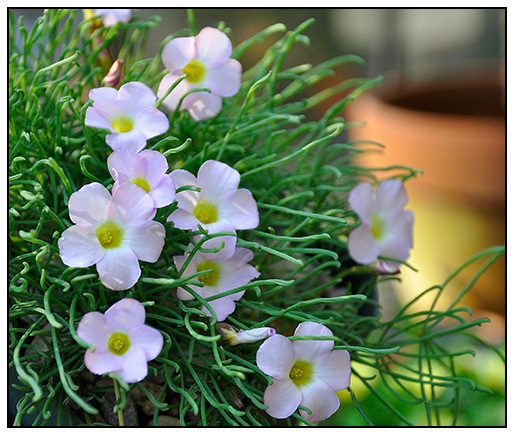 SUCH A PRETTY BULBOUS OXALIS DESERVES A BETTER NAME. ONE OF SOUTH AFRICA'S NICEST SPECIES, THIS SPECIES HAS BOTH INTERESTING FOLIAGE, AS WELL AS A NICE FLORAL DISPLAY FOR AUTUMN CONTAINERS UNDER GLASS. 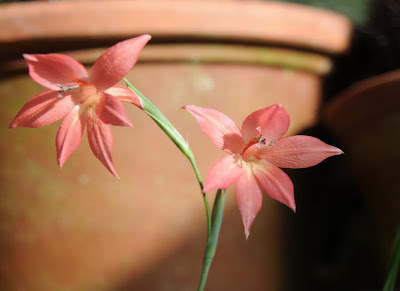 Mid-November marks the beginning of the peak season in my greenhouse for many bulbs. The South African species are all starting to bloom, and it can be difficult trying to keep up with the number of species that bloom each week. Many are long-lived in collections, so I feel like I am repeating myself every year, but each pot seems to bloom at a different rate. Narcissus are very variable, but on a scale - they either become better each year, dividing and becoming more floriferous, or, they simply fade away. 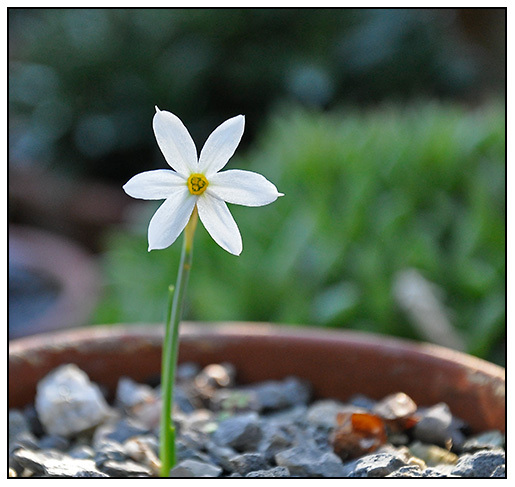 The tiniest fall-blooming Narcissus, N. serotinus, native to the middle east and much of the Mediterranean, does not divide, not does it set seed, most likely because I have a single bulb. I think it is time to add more bulbs to this container, for in the wild, this is a species which likes company. ( I order mine from Paul Christian Rare Bulbs). On the other hand, my pot of green Narcissus viridiflorus which began with a couple of bulbs, now has nearly a dozen bulbs, my reward, I think, because I repot the collection every year, and carefully fertilize them every other week with a weak solution of tomato fertilizer. I am trying to reduce or even eliminate my collection of bulbous Oxalis, only because I am bored with them, and would like some new genus to collect for a while, but it there was one to keep, it would be Oxalis polyphylla var. heptaphylla, if only for its foliage which is interesting enough - forming an alpine-like bun consisting of thin leaflets that look almost like pine needles. Potted plants at Wisley are kept in alpine houses and cold frames, but when they are in peak bloom, they are pulled from the other houses, and placed in a sand plunge bed, in a display house. Look at a sample of their displays this week here. My house is no Wisley, but it does provide a sample of what they can grow ( and I have a staff of one). 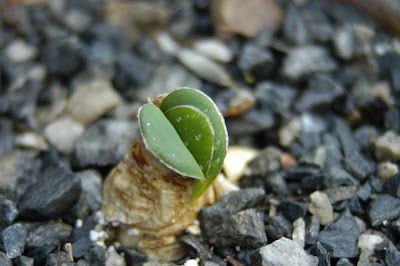 A Massonia jasminiflora bulb, which I have had for three years, is almost ready to bloom (finally). This South African native is a rarer form of the Massonia genus, than the one most collectors, collect. I know, most of you have not heard of Massonia, but they are more familiar to those who grow South African bulbs and sometimes those who collect succulents. More on this species in a week or two, once it blooms. 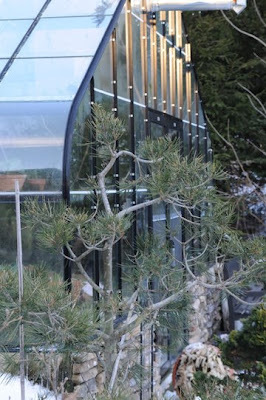 I always admired the Wisley alpine house displays in photos ( I have yet to visit), and I am one of those crazy people who if I won megabucks, I would not go to Vegas or Hawaii, I would travel the world and collect more unusual plants and build a custom designed glass house to keep them in. When I built my current greenhouse, I found these metal sand plunge beds in England, so I ordered them and I use them regularly for my own little indulgent displays. ( I know, even more crazy, but hey, I admit that I am more than a little obsessive about such things ). On weekends, I like to walk through my greenhouse, and pull the best looking plants to set in my display beds. It's a little sad, because no one sees them but me, but since I only get a few hours a week in my greenhouse, I try to enjoy every moment. Hey......I make up my own rules. A pot of Crocus medius blooms in the sunshine. 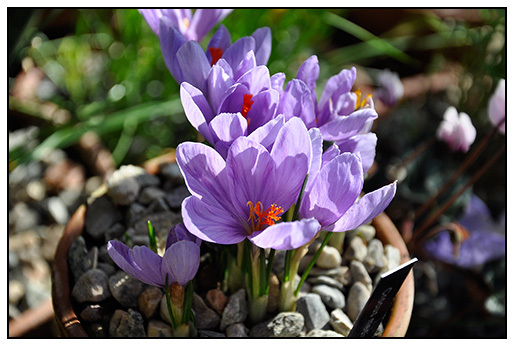 This autumn blooming crocus looks like it has a virus, which is not uncommon from stock grown in the Netherlands. 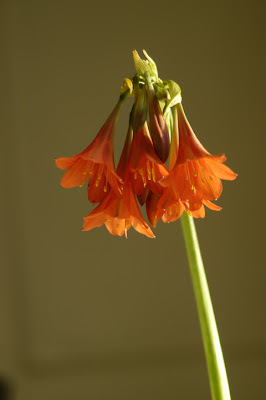 This is one of the rarest plants that I have, a bulb, also from South Africa. Strumaria unguiculata. When it is mature, it will have magnificent while umbels of flowers. I am growing it in pure sand, and have been cultivating it for 6 years. 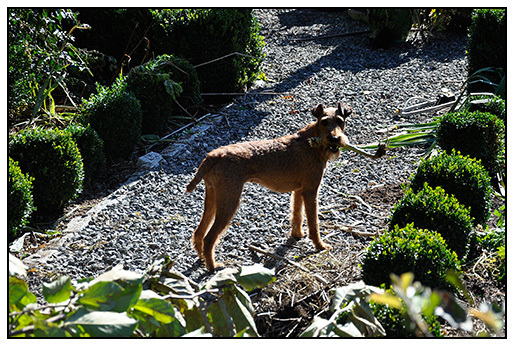 Lydia enjoying some cabbage stems as I clean the garden after our snow storm last week. Looks like a pipe. It's a little self indulgent, ( um....a little? ), but I just can't help myself. I mean, how could I not post these images that I took today of some of the many flowering bulbs and plants in the greenhouse. Especially when the sun came out after a snow storm hit outdoors. Winter trudges along with 5 inches today, and with 4 feet still on the ground in the shade, it seems spring may never come. But as we gardeners know, in six weeks, we know that the ephemeral wild flowers will be in bloom, and the maples, magnolias and native trees will burst into bloom. So bring it on, man, bring it on. Ho hum ( yawn), just more pretty spring flowers photographed against a snow covered woodland. What ever. I moved the Cyclamen out of the sand bed in the rear of the greenhouse, so that I could arrange my own little flowershow which sadly, no one will see except me ( which is a little wierd when you really think about it, for, 'why' do I grow these anyway?). Maybe I can call this my digital flower show? Color is a curious thing. It can be so universally beautiful, collectively agreed upon shades of tints and tones which everyone loves. Then, there are those of us who are more individual. Who prefer unusual shades which either surprise us, shock us or simply, stimulate us in some way. And so it is, with shades of buff. 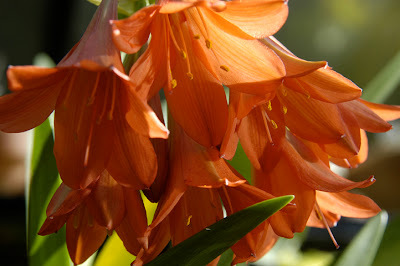 Currently, in my greenhouse two plants in particular are blooming, each in a similar hue, that of buff. Or beige, or is it brown? Either way, I think the color is exciting, and quite pretty actually. The first, a new hybrid Cymbidium which we purchased this autumn at our local Orchid society annual show, ( at Tower Hill Botanic garden, in Boylston, MA), a Cymbidium cross which we spotted under a salesmans table, in bud. He sold us that it was a new cross entitled 'Massachusetts Sunset' or 'Mass Sunset" as the tag reads. I don't know too much about it, perhaps I shall Google it and find out, but regardless, it has now bloomed and I am including a few photos here which show how different the color looks during different times of day, and the light in which it is photographed. Reminding us all.....to never choose paint color at the Home Store under florescent lights, (unless you are painting a room washed in florescent light). A pet peeve of mine, happens to be watching homemakers on Saturday morning either choosing colors for their living room by matching a swatch or a pillow, or, those who simply choose a color without testing it painted on the wall. Think - "Green grass in the summer reflecting light in" or " Snow reflecting white light in" or...OK, forget it, I will leave this rant to my design blog...but look at how different this orchid looks in each shot. Light is critical in choosing color or in photographing color for accuracy. 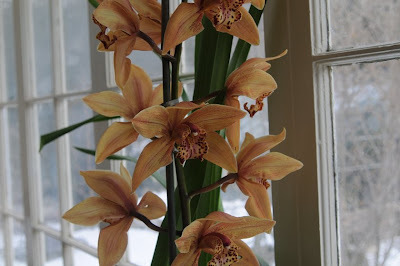 I love the color of sunsets in winter, and this show proves how the Cymbidium "Massachusetts Sunset' earned its name. Cymbidium 'Massachusetts Sunset" has a fragrance which I think smells exactly like dried orange peel. 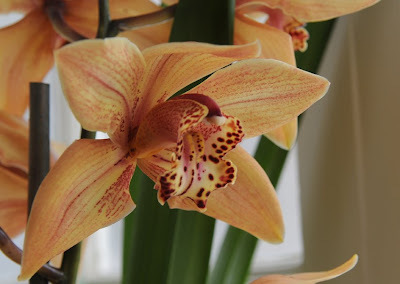 Scent is such a powerful memory, that everytime I smell a large, standard Cymbidium, I am transported back to when I was in high school, and I had to go on an interview for my first job, a work-study position as a gardener for a Fletcher Steele garden, here in Worcester. Helen Stoddard, who's estate it was, had brought in a large cut spike of a brown, standard Cymbidium and had it in her parlor. 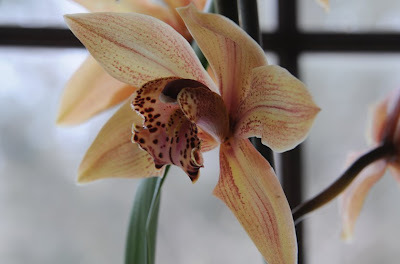 The memory of the March light, the color of the flowers which then, to me, we're quite exotic since the only Cymbidium one saw normally in my town came in acetate corsage boxes at Mother's Day. 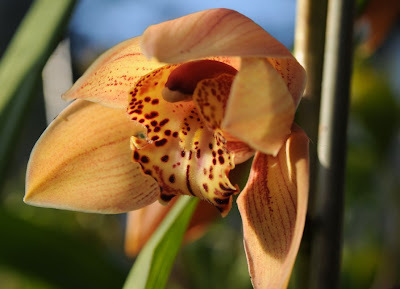 Today, my favorite color in this genus of orchids that are terrestrial ( grown growing) and cool greenhouse growers, are the green and brown flowers strains. I just love them. 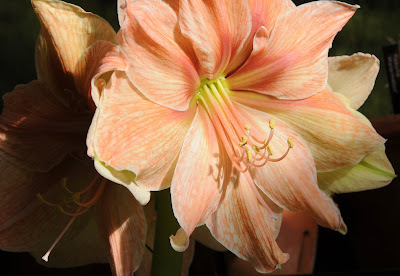 A new Hybrid Amaryllis, Exotica® with a unique color which actually has a hint of yellow in it. A new variety which I found in the White Flower Farm catalog, was this Amaryllis variety called 'Exotica®', a registered variety which is a bit more pricey than the average Dutch varieties, but has a color which is most interesting, which shades of yellow, mustard, lime and pink in it. Or, is it raw veal? 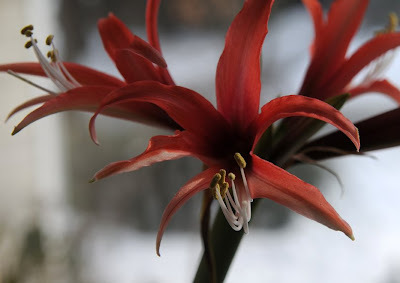 Anyway, I do like it, and, if the cost seems steep, the Amaryllis from WWF are worth it, since each will produce at least 2 of not 3 stems, so one bulb can be in bloom for most of the winter. January sunset colors on the greenhouse Friday, before another snow storm arrived. Next week, we are being warned that temperatures will reach -5 below zero F! I can't imagine that my gas furnace, which explodes ever time it ignites, will ever make it. We shall see! I am in Florida next week speaking at a conference, maybe it is best if I do not know what happens while I am gone. 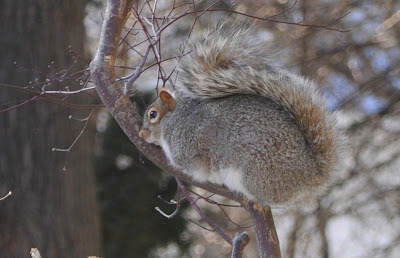 An Eastern Grey Squirrel trying to stay warm in our sub-zero temperatures. 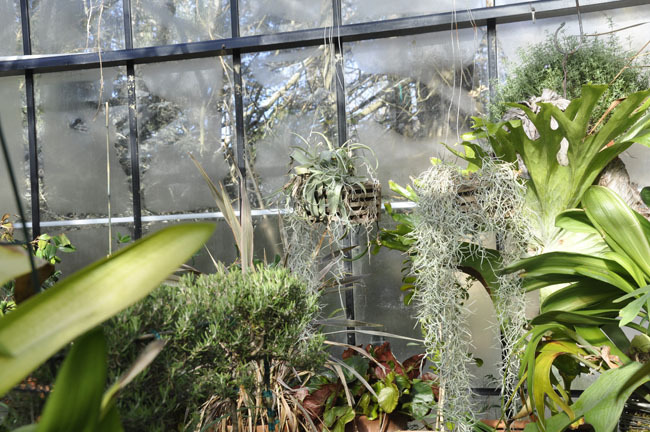 A view of the greenhouse on an unseasonably cold November day. As temperatures hovered near 18 deg. F, ice forming on the glass and winds reaching 30 miles per hour, inside, the sun was strong enough to keep the temperatures near 80 degrees making the weekend task of winterizing the glasshouse with bubblewrap warm enough to take our shirts off. 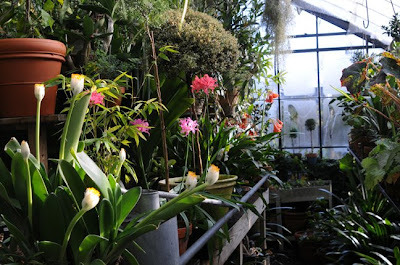 This view, down the aisle on the western side of the greenhouse shows some of the blooming plants, mostly South African Cyrtanthus, Nerine and Haemanthus this time of year. The steamy air, as evening closes in, is just beginning to freeze into ice crystals on the glass walls in the back. Still this is one of my favorite times of day in the greenhouse, when the sun is just at that special angle, the air is warm and fragrant with Rosemary, Fragrant Olive and early Narcissus. It is sweet and fresh, yet moist and damp - just unique to winter greenhouses, I think, but good for the soul. I never get bored with the seasons with the greenhouse now, each season is now just a different list of superlatives. Started four years ago from seed gathered in South Africa, these rare Lachenalia species is blooming for the first time. 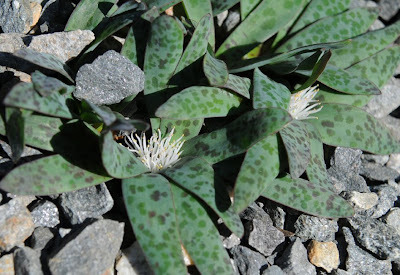 Lachenalia pusilla is rather prostrate, with speckled foliage which remains close to the ground. The stemless flowers bloom low, in a raceme, and when the sun hits them at mid day, the smell a bit like coconut ( they look like it too!). This Lachenalia also has a bit of an identity problem, there appears to be some taxonomic confusion whether this is truly a Polyxena and not Lachenalia. As taxonomists fight it out, we enthusiasts continue to keep it in our collections as Lachenalia pusilla. They look a rather bit like an undersea anemone, don't they? 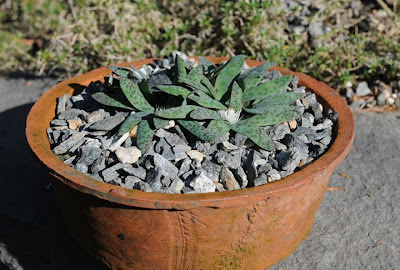 I potted them in a home made terra cotta pan, which I think makes this pot quite attractive. This autumn blooming Lachenalia is the first of the genus to bloom for me this season. I have found that there are some real benefits with single pane glass, and one of them is not heating costs. The benefit is light quality, so critical for many Southern Hemisphere plants which are primarily winter blooming as demonstrated but this pot of seed grown Lachenalia pusilla. When grown in the brightest sun possible, one can achieve the best characteristics with many of these plants, who naturally grow out of doors in direct sunlight. 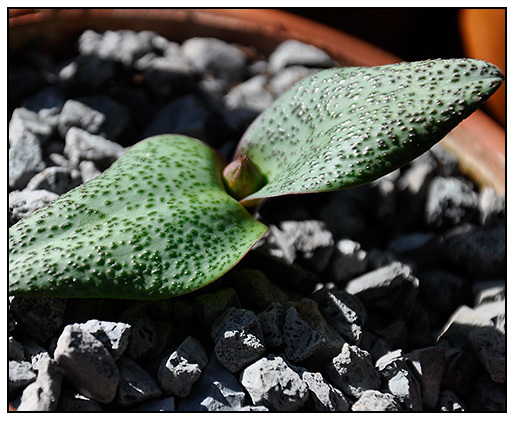 I have found that when I keep many of these mottled or reticulated species in the sunniest part of the greenhouse, near the glass, their foliage darkens, the spotting becomes more abundant, and their overall form is more dense. Please help identify my mystery Gladiolus. Received as Gladiolus tristis, this pot of winter-blooming Gladiolus has bloomed in a very uncharacteristcally tristisness. Perhaps it is a Homoglosum? I have many books and photos, but the genus is quite unfamiliar with me. I have been holding off on collecting the many wonderful species of South African Gladiolus for a while now, but got some this year to try. 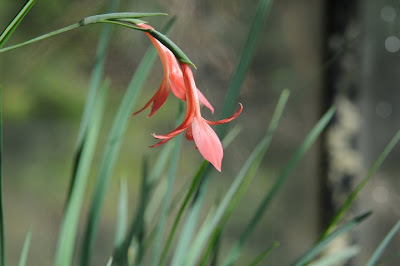 Gladiolus tristis has been a classic cold greenhouse plant for years, so I thought I would begin with this. Especially since it is known to have an intense fragrance in the evening, which one can enjoy by bringing the pots indoors. No fragrance with this beauty, but it is still quite striking. Please help! The first pot of Narcissus romieuxii ssp. cantabricus with buds emerging. These tiny bulbocodium-like Narcissus are the earliest of the fragrant, winter blooming species native to Morocco, the Atlas Mountains and Turkey. 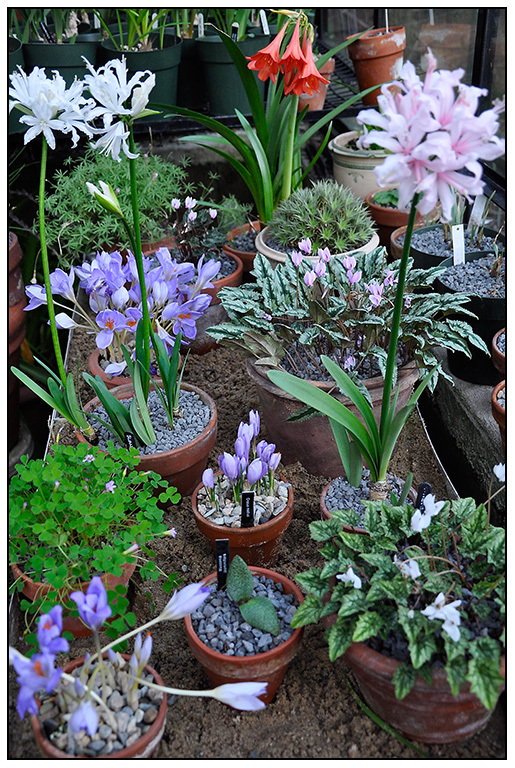 A favorite of mine, they are common amongst many plant collectors who grow miniature bulbs, or alpines in cold greenhouses, so they are a true cross over plant, which appeals to many. Rarely seen in the states, this is a narcissus one will probably only see at a Botanic garden or at the home of a collector. I know of only two sources in North America where one can buy bulbs, and actually, only one carry's more than one species. If you think Narcissus in the fall and winter is strange - remember the paperwhite ( Narcissus papyraceus), a neighbor of these species. And, in case you were wondering, yes, you can bring Paperwhites back into bloom year to year, in exactly the same what one cultivate the other winter blooming Narcissus species. 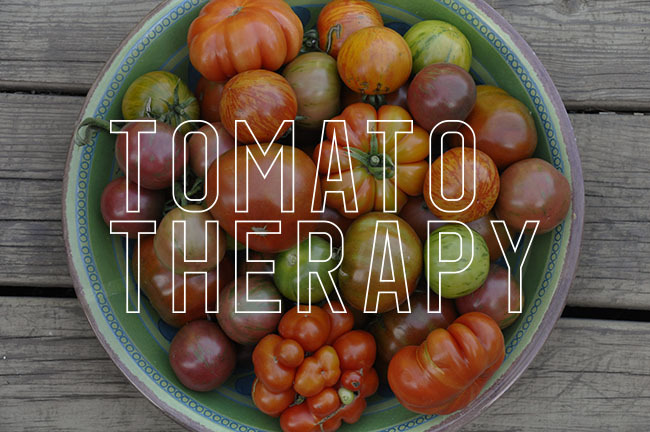 Not practical for home growers, but if you happen to have a cold greenhouse or a room which stays cold, bright, and never freezes, you can do it too. But my point is, many of the more unusual Narcissus are autumn or winter growing - why be so normal? 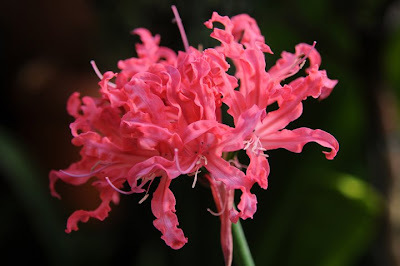 The last of the Nerine sarniensis are blooming this week, and an interesting thing has happened. 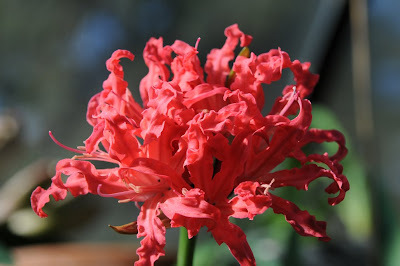 I mentioned earlier that many if not all of my Nerine sarniensis have bloomed this year, and I am relating this phenom to a late division of bulbs which I executed in early September. This variety, named 'Kola' has unusually wavy petals, ( undulata-ish or Alba-ish?! )...anyway, an even more interesting fact is that each of these divisions is blooming with a slightly different tint of pink. Call me crazy ( or mixed up, since, sure, I could have mixed up the bulbs too, (but I don't think so), ( besides...the wavy petals are unique to this variety), something has gone wrong here, yet the similarities are interesting. 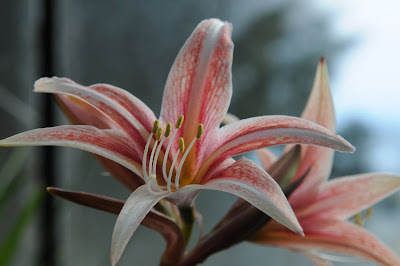 Maybe the soil is different in each pot, which it is, but then again, the bulbs have been formed for a year, or two in advance, so that could not be the case....a mystery unfolds ( or curls) but whatever the cause, these late bloomers in the Nerine world are pretty nice cheer, for a cold, wintery day in November when everyone else is raking leaves and complaining about how cold it is, I am sitting stripped to the waist, drinking a beer in the hot sun enjoying the rest of the day in the garden ( or I am high from the bubblewrap spray mount). This unknown species, or most likely a cross between two species of Cyrtanthus blooms regularly for me in early December. 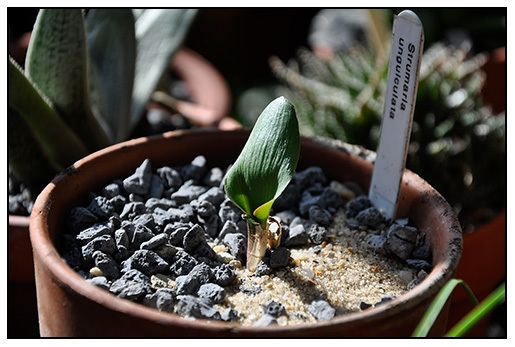 Purchased at an IBS (International Bulb Society) bulb auction at the Huntington Botanical Garden in Pasadena, CA, in 2000, this bulb has grown to fill two pots, and for a species notorious for being difficult to bloom, for some reason, I have had good luck with both pots. One pot has soil which is mostly granite chips, perlite and sand, and the other pot is 14 inches wide, with simply peat-based Pro-mix, a professional mix containing perlite and peat. Both soil mixes have been augmented with gravel, but I wanted to test the differences of a smaller 6 inch plastic pot and a massive clay pot. Both have grown to fill thier pots, and bloom about three weeks apart. This tiny lapierousa was started by seed in 2002, after the advice of some friends during an online chat on the Pacific Bulb Society (PBS). I had complained that the cost of South African bulbs as well as the availability of finding any species in the U.S, let alone in the world seemed prohibitive for most collectors. I was encouraged to purchase seed from one of two seed suppliers in South Africa, Penrock Seeds and Silverhill Seeds. I gathered my books and journals, and cross-referenced what species and genus I wished to try, and placed an order. They all grew so easily, and are now begining to bloom. I find it fascinating to have fifteen to twenty of one genus blooming, so that one can see the differences between them, let alone the fact that hardley anyone grows the lesser known species, nor even the more 'common (?) species of many of these genus. Perhaps my rarest bulb, after acquiring it last year, and allowing it to 'bake' in a large dry pot in the back of the glasshouse, this precious Brunsfigia bosmanniae surprised me this weekend with a spurt of new growth, just on time after it's first watering a month ago. Of course, I don't expect it to bloom, but naturally, I will dream of it. This species is so difficult to bloom in captivity that my hopes are not that high, but you never know. This plant will take ten or more years to mature before I can expect any chance of it's spectacular and rare blossom, which will appear in our Northern Hemisphere's late spring, after the bulb starts to loose it's foliage, and go dormant. 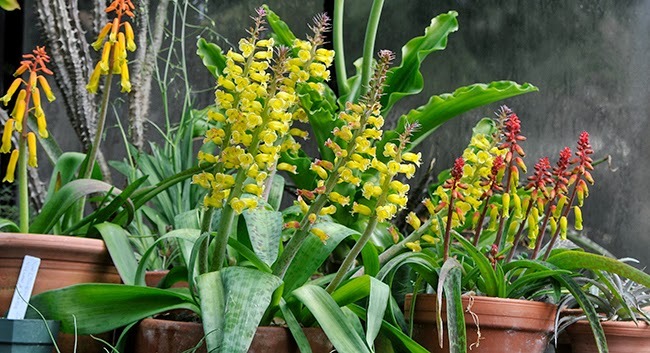 Well, not rare, but certainly more unusual and less common to most people, but this is one South African plant that you could grow as a houseplant, (avalable at Logees Greenhouses online, if not, I know that have it). 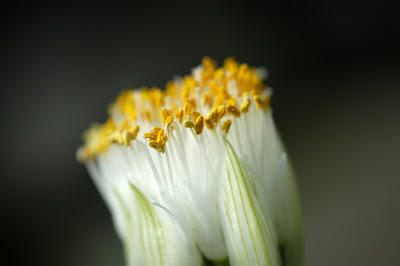 This Haemanthus also blooms exactly this week in December every year. The shaving-brush blossom is unique with it's boss of thick white stamens, which is more beautiful in a photo than in real life, since it tends to get lost in the greenhouse. However, the foliage is superb, and as this plant is dividing nicely, I can expect a nice full pot by spring, when I will most likely divide it before allowing it to go ratty and dry for the summer.